Panna cotta, literally cooked cream in Italian, comes from the Piedmont region in Northern Italy. Traditionally accompanied by fruit coulis or caramel, panna cotta is increasingly common all over the world and flavours are becoming more experimental. A good panna cotta will have a ‘just set’ consistency - wobbly, but not solid, and able to hold its shape. Indulge with our delicious collection of panna cotta recipes with methods to suit all abilities and tastes. For a taste of the traditional try Shaun Hill's Panna cotta with summer berries, easy to prepare but effortlessly elegant. 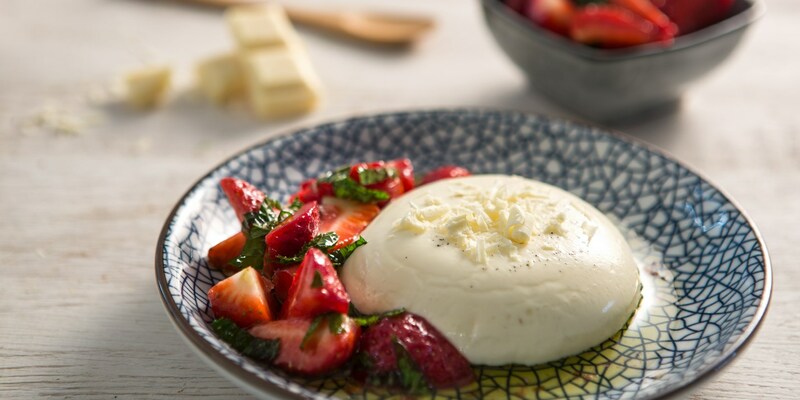 Robert Thompson’s Vanilla panna cotta recipe makes a wonderful summer dessert when served with strawberries, or try Greg Malouf’s fragrant Rose and buttermilk panna cotta, a truly stunning sweet dish. For something a little more unusual try James Sommerin's fun Bubblegum panna cotta or James MacKenzie’s Liquorice panna cotta with rhubarb. Panna cotta needn’t just be saved for dessert - Alan Murchison's Sweetcorn panna cotta with crab cannelloni is a fantastic savoury recipe.